If I had to guess which Avengers: Endgame cast member is having the most fun on the film's press tour, I'd have to go with Robert Downey Jr. 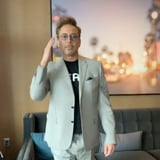 The actor, who reprises his role as Tony Stark (aka Iron Man) in the upcoming superhero movie, has taken to Instagram over the last few days to share videos of himself dancing along to classic rock 'n' roll hits ahead of each press event with his cast mates - and I have to say that the man has some moves. So far he's graciously provided us with some quality choreography to the tune of Blondie's "Heart of Glass," Jimi Hendrix's "Purple Haze," and Queen's "Coming Soon." This is honestly the only kind of content I ever hope to see on my timeline, and it does a pretty decent job of distracting me from the fact that we might just lose his character in Endgame. Read ahead to see what Robert has shared so far, and keep your fingers crossed that he keeps this up until the movie premieres.